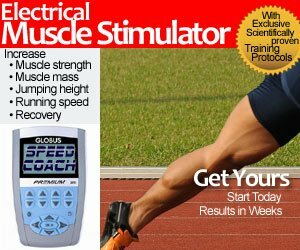 In the previous article, The Winning Mindset, Part 1 and Part 2, we focused on Sports Psychology and Optimum Sports Performance, and profiled GB Master, Rick Beardsell’s M35 successful campaign on becoming 2014 World Indoor 400m Champion. Despite having to battle through serious illness and injury setbacks along the way, Rick demonstrated that what the mind perceives the body can achieve. The basic premise of that story was simple: fortune favours the brave. In this article, we turn our attention to another amazing Athlete, W40 GB Master, Michelle Thomas, whom many believe has the capability of being crowned as a future European and World Masters Champion in either the 100m, 200m or 400m. (Individual and Relay). Just Like Rick, Michelle has had to contend with illness and injury setbacks, which have threatened to permanently curtail her time in Athletics. However, as you are about to discover, Michelle too has consistently demonstrated the same Winning Mindset and Physical attributes that goes into making a Great Champion and an Ambassador of hope and inspiration to others, both in sport and life. 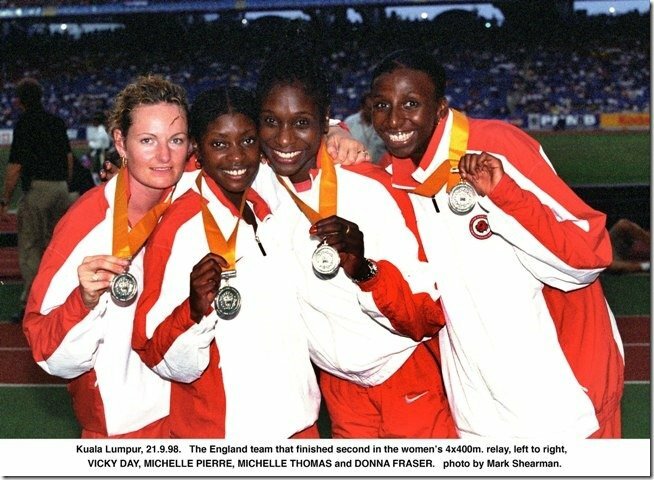 Michelle Thomas took up Athletics as a teenager while attending Reside Middle School in the UK. Having participated in several school sports, including swimming galas and netball tournaments, it was only when Michelle turned her attention to competing in the school sports day sprint events did her talent for running fast get recognised, particularly when she managed to beat her teacher in a 200m race. She was guided and encouraged by her teacher and friends to participate in the Hereford and Worchester Council District Sports Championships, in the short sprints over 100m and 200m, where she managed to convincingly win and set new track records. Those early victories ignited Michelle’s passion for Athletics and gave her the confidence, motivation and commitment to pursue her dream of competing and medalling for GB as an International Athlete on the World stage: A Dream that eventually became a reality, with the help of her coaches Ron Rodden and former legendary Sprint Sensation, Linford Christie. Michelle began seriously competing back in 1990 as a 19 year old , clocking an indoor 7.61 secs over 60 metres at Cosford. A year later, she produced an 18.05 sec clocking over 150 metres at Birmingham, demonstrating early potential as a future 200/400 metre specialist. But It wasn’t until 1997 that she began to emerge as a formidable force over 400 metres, both individually as a brilliant 4x400m relay runner, clocking an impressive L3 51.7 secs for GB at a late August meeting in Munich, Germany as well as 23.98 secs clocking, a week later, over 200 metres in Catania, Spain. 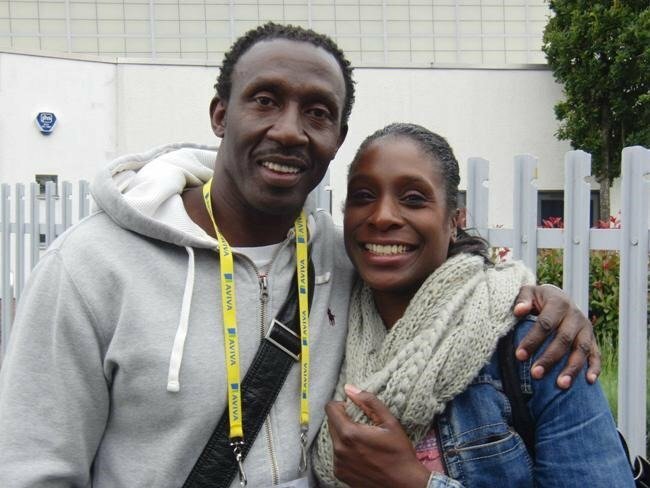 Going into 1998, Michelle was introduced to International 100m/200m Sprint Champion, Linford Christie and his training squad, who began to help Michelle improve her speed and speed endurance, strengthening her strengths and ironing out her weaknesses over the winter. “Back then, I was fortunate to work with great athletes and receive excellent coaching from Linford. His relentless dedication & support assisted me to perform to my life time best,” she said. Michelle managed to lower her 100metres to 11.89 secs and consequently produce a new personal best clocking of 52.48 secs for 400 metres at a July meeting at Budapest, Hungary in 1999. 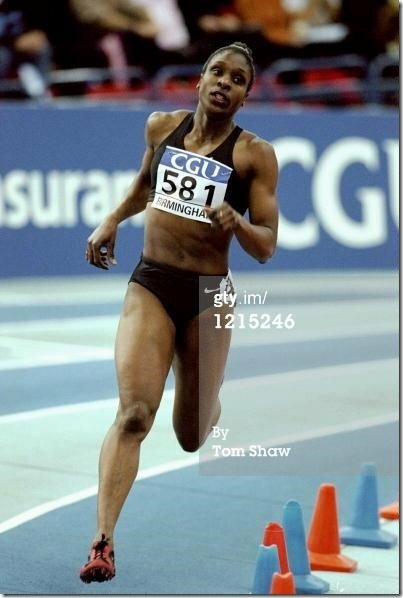 Michelle also proved to be strong over 800 metres, a few years later, coming 4th in the British AAA’s Championships, in Birmingham in 2001 with a 2:09.45 clocking. In 2005, Michelle also managed to successfully compete for her Club, Birchfield Harriers over the 400 metres Hurdles, with a personal best clocking of 58.77 secs. Michelle continued her Athletic pursuits, this time as a GB Master, beginning back in 2007 until present. During this time she has ventured out over distances, ranging from 60 metres to the 400metres. Michelle began training with Ron Rodden in 2010 when she came to London for work purposes. 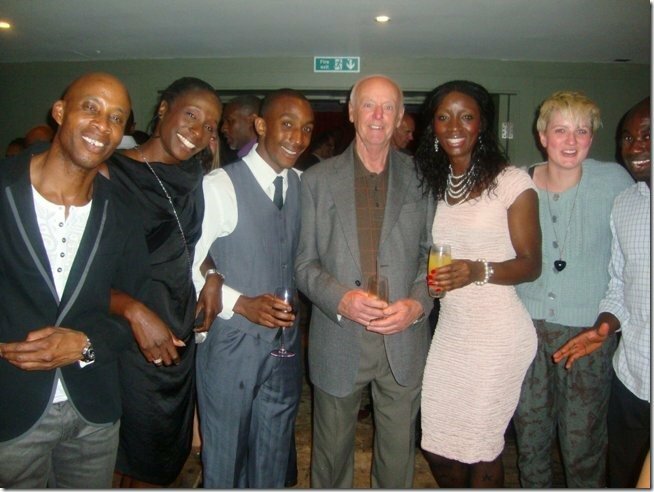 Coach Ron Rodden and TVH athletes including 2014 World Masters Indoor M35 400metres Champion, Lesley Owusu, left of Ron in picture. Michelle graduated with a BSC in Sports Coaching from Wolverhampton University in 2008 as well as further graduating in 2011 with an MSC in Sports Science. As a College Teacher, Michelle has successfully helped countless students along their career paths by obtaining Diplomas in Sports Science to the highest level. As a mother of two, Michelle has carefully managed to balance her work life, family life and athletic training. As a Masters Athlete she has managed to lift several British titles over 60 metres, 100 metres, 200metres, remain highly ranked as one of the top performers in the UK. In January 2014, Michelle demonstrated her true strength of character, recovering from an operation to remove benign tumours above her womb and then competing two months later in March, over 60 metres, at the British Masters Indoor Championships, earning a silver medal. Unfortunately late in March, Michelle tore one of her calf muscles and had to receive six weeks treatment- interrupting her training preparation for the outdoor season. In July, she was struck again with an injury, this time sustaining a plantar fascia flare up attributed to her earlier calf injury. Her competitive season wasn’t looking promising, but Michelle persevered with what minimal training she could accomplish, to eventually medal at the British Masters Championships in August in both the 100m (Silver) and 200m (Gold) with times of 13.11 and 27.22 secs respectively. What it felt like to compete at BMAF. “I enjoyed competing at BMAF. I was asleep in the blocks 100m and ran 13.11 into a headwind, but it was a good result considering that my training was set back following my plantar fascia injury 10 days prior to the championships. 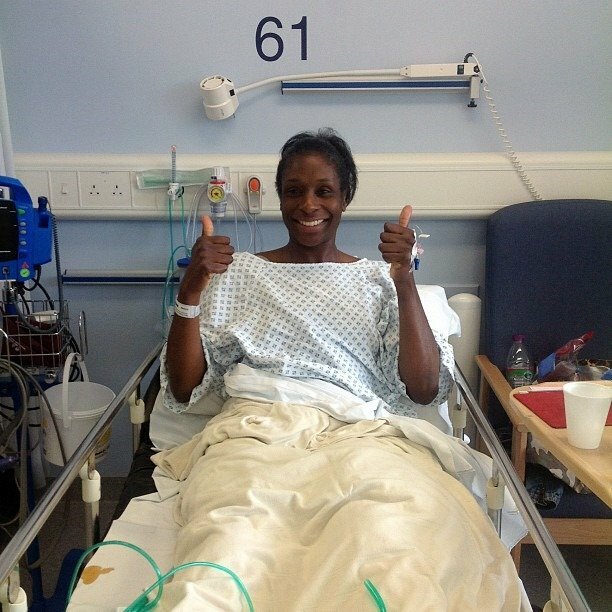 It was in late August, in the 2014 European Masters Athletic Championships held in Izmir, Turkey, that Michelle managed to get into both the 100metres and 200metres finals, a remarkable feat, considering a year hampered with illness and injuries, earning both a 4thand 6th place, with a seasons best of 13 .0 seconds to be only inched out of 3rd place (12.95 secs). “Find your event by trying out different ones in the first instance. You will soon realise exactly what you are good at. Find a good coach, who can work with you. Do not turn up late for your sessions! Here’s a snapshot of Michelle’s training week. Harness resistance training. Hopping and bounding. Hill sprints. Grass running sessions. Weight lifting and circuit training. Supplements-Multi-vitamins and protein, and magnesium with calcium supplement. Those of us who have seen Michelle’s brilliant performances this year unanimously agree that, fully fit, and without any injury problems over the coming months, she has the ability to emerge as a World Beater in 2015.